James Meyer, U.S. Army Sergeant First Class, and his unit came home from Afghanistan a week before Christmas. Meyer served in the Marines for six and a half years as Active Duty, and then left the service for several years to pursue a civilian career. He joined the Hillsborough County Sheriff’s Office in 2005 and went back to the military in the Army branch for the Army Reserve Military Police. He was NCO (non-commissioned officer) in charge of this last mission and took about 25 members of the 810th Military Police Unit with him. This was his third tour to Afghanistan. 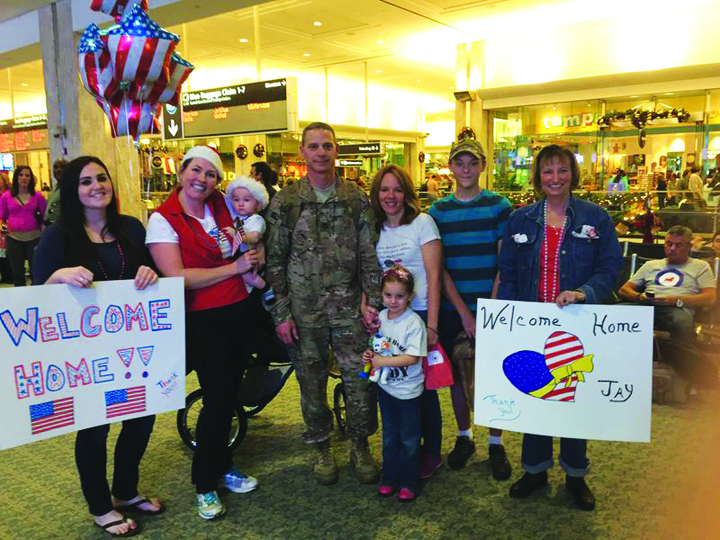 Meyer and his unit arrived back home at the Tampa International Airport and were greeted by family and friends. Meyer was greeted by his wife, Sandra, and his son, Triston (13) and daughter, Stevie (5). “It’s wonderful to have him back home. It’s been a very long year and we’ve done this three times over seven years, so it becomes exhausting and overwhelming. The kids and I missed him very much and it is great to have that hole in our life filled again,” said Sandra.